Before you take your child to preschool or another early childhood education program, it’s a good idea to help them learn how to socialize properly with other children. If your child grows up without the opportunity to interact with others, it could lead to some problems down the line. 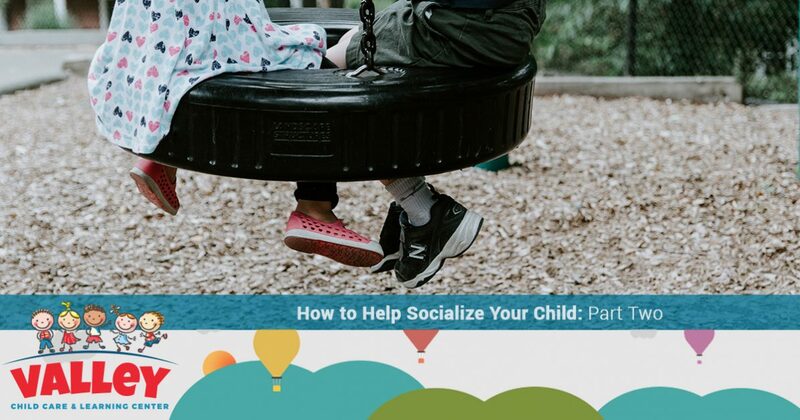 In part one of this series, we gave you a few tips on how to help socialize your child and advice regarding what age you should start. As we continue with part two, we will provide you with a few more tips to help your child learn the necessary social skills to become a happy and friendly child. When it comes time for your little one to start going to school, you want to be sure that you choose an education program where your child can thrive. At Valley Child Care and Learning Centers, our early childhood education program is designed with your child’s learning abilities in mind. We provide a safe and friendly environment for your kiddo to grow, learn, and interact with others. With 10 convenient locations in the Phoenix area, we make it easy for you to provide your child with a high-quality education. 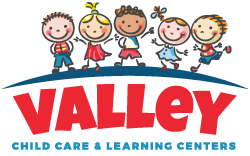 To learn more or to enroll your child in one of our programs, contact Valley Child Care and Learning Centers to get started! If you live in a neighborhood with a lot of families with children, encourage your child to make friends and play with the other children in the neighborhood. The great part about living in areas with a lot of children is that you get a versatile mix of ages. In school, your child will learn to interact with children in the same age group, which is important for their social development, but playing and talking with older kids will benefit your kiddo as well. Another way your kiddo can benefit from playing with neighborhood children is that they live close by, giving them the chance to make friends that they can play with on a regular basis. When your child goes to school, they will have the opportunity to make even more friends, but it will also be more of a hassle to set up play dates if they live farther away. One issue that shy children often run into is that they are too afraid to speak first and they can become more uncomfortable when they are forced to wait their turn to speak. An easy way that you can help your shy child overcome their fear is to plan out a statement that they can use when they meet new children. Have your child practice introducing themselves at home where they are comfortable, that way, when you go to a public place like the park, they will feel comfortable saying hi when they meet someone new. Unfortunately, sharing is not something that all children will do willingly. Unless taught, children are more likely to become possessive over their toys, which can become problematic in a social situation. In order to combat the idea of not being able to share, it’s important that you make sharing a normal part of your family lifestyle. There are many ways that you can normalize sharing at home that will translate to social situations that your child might experience at school. For example, you can make mealtime a sharing opportunity. Instead of pre-portioning meals onto the plate, give your family the opportunity to serve themselves. Place all of the food on the table and allow everyone to pass the dish and put their own food on their plate. Another way that you can practice sharing is by playing games. The idea of sharing is all about taking turns, and when you play a game with a group of people, you are forced to take turns and be patient. You can play games as a family or even invite some of your little one’s friends over to play so that they have a chance to experience sharing with people their own age. Sign Up at Valley Child Care and Learning Centers! Socialization and sharing are two important lessons that your child will learn, and at Valley Child Care and Learning Centers, we provide your little one with a safe place where they can learn and grow among friends. Our early childhood education program is designed to challenge and enrich your child in numerous ways. Browse our website to learn more about our curriculum, nutrition policy, and more, and be sure to contact one of Valley Child Care and Learning Centers’ 10 location in Phoenix today!